INDIALANTIC — Private–sector entrepreneursm around the nation are driving the resurgence of business startup activity, to the tune of more than 400,000 new ventures in 2015. Small–business entrepreneurs are the “mystic heroes” of the economy, and Florida is one of the hot spots for this kind of job creation and economic development. In fact, according to data from the U.S. Census Bureau, Florida was one of the best states in the nation for starting a business in 2015, with South Florida leading the way. The local market has also seen a flurry of startups over the last 12 months, with businesses being created in a range of sectors, from technology to manufacturing to service firms. The local upstart momentum continues in 2016 with the recent launch of Prime–One Insurance, an independent agency formed by area businessman and insurance–litigation attorney Michael Sapourn, who grew up in an entrepreneurial family in the Washington, D.C., area. “Prime–One Insurance is open and it has been writing business. 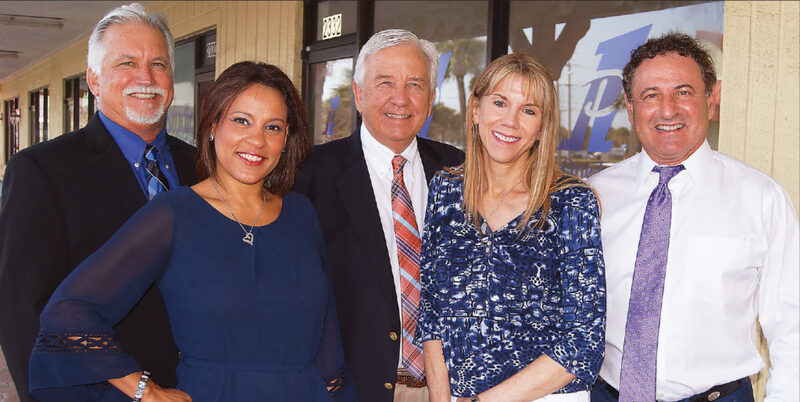 We’re definitely excited about this new venture,” said Sapourn, president of the company, in an interview conducted at the Prime–One Insurance office in the Village Shoppes of Paradise Beach. Sapourn has owned the Village Shoppes of Paradise Beach for many years. The current tenants include Paradise Beach Florist, Christine’s Hair Salon, Heather’s Dance Studio, and MTB Surf Emporium. This is the only commercial complex he now owns in Florida after selling a number of properties. His Prime–One Insurance team includes Mike Hoagland, senior vice president; Paul Weber, chief operating officer/sales agent; and Rosa Santiago, marketing director. They are all longtime insurance–agency professionals, as is Sapourn, who has been hands–on in every aspect of the field since working in the family business. “I didn’t think I would get back into the insurance–agency business,” said Sapourn, who worked in the industry for 23 years in the greater D.C. market and holds the Certified Insurance Counselor and Certified Risk Manager designations through The National Alliance for Insurance Education and Research. “I said if I did, it would be with the right staff. I have known Rosa (Santiago) since she was the first tenant in this shopping center I bought in Florida about 13 years ago. Mike Hoagland and Paul Weber are insurance professionals who I’ve come to know and admire. So when the three of them became available, I said this was a rare opportunity to put together a great staff with the resources to grow this independent agency, while providing top–notch service to customers. With this team now in place, we see a lot of opportunity ahead to build Prime–One Insurance. Independent insurance agencies still control a majority of the entire property–casualty market, writing nearly 57 percent of all premiums. And they write 35 percent of all personal lines premiums, according to the Independent Insurance Agents and Brokers of America. and Putnam. Brevard County is No. 44 out of Florida’s 67 counties. Independent insurance agents, as opposed to “captive agents,” who work for a specific company, also dominate commercial insurance sales, writing nearly 80 percent of a market that has grown by more than $35 billion over the last three years, the Independent Insurance Agents and Brokers of America report said. In many states, independent insurance agencies dominate both personal and commercial lines. The report says the industry agency system as a whole is “dynamic,” with improving business conditions. Prime–One Insurance will be hosting an open house to introduce the team members to the business community from 5:30 to 7:30 p.m. on Thursday, April 14. The agency’s address is 2332 N. Highway A1A. The event, which will include food, beverages, and music, will be held in conjunction with the Melbourne Regional Chamber of Commerce and the Cocoa Beach Regional Chamber of Commerce, said Santiago. Commander Sean Riordan of the Melbourne Police Department will be the guest speaker, as this part of the Indialantic community falls under Melbourne’s jurisdiction. “A lot of people in the area don’t realize this and that’s one of the reasons why we asked Commander Riordan to deliver the speech for the open house,” said Santiago. “The open house will present an opportunity for people to meet our team as we begin introducing ourselves and begin branding Prime–One Insurance in the market,” said Sapourn, a University of Virginia economics graduate who earned his law degree from Georgetown University. He moved to Florida about 15 years ago and was a licensed public adjuster for seven years. He’s often hired by other attorneys for his insurance expertise. Sapourn is a qualified expert in federal and state courts in several areas, including insurance agent’s standard of care and insurance policy interpretation, for example. Decades ago, his father started an insurance brokerage agency in the D.C. area. Paul J. Sapourn Insurance Associates Inc. grew from four employees to some 40 professionals before the business was sold. Michael Sapourn served as president and chief executive officer of that agency for 15 years, starting in 1987. Under his leadership, the company won a number of awards from insurance companies and was singled out for its “best practices” in the field. Sapourn formed Prime–One Insurance in January, a property–casualty agency that markets a full product line excluding health insurance. Prime–One Insurance has agreements with a wide range of carriers, including Safeco Insurance, People’s Trust Insurance Co. of Florida, and Federated National Insurance, on the personal lines side of the business, for instance. Prime–One Insurance plans to add new agents and perhaps another office as it grows, said Sapourn. Recruiting and agent development are topics of concern in the insurance industry, especially in the Sunshine State. Nearly 20 percent of the American insurance agency system’s work force is expected to retire by 2018. This talent gap threatens the growth and stability of the industry, but the Florida Association of Insurance Agents has helped bridge that gap by drafting a recently approved bill passed by the Florida Legislature. The bill authorizes the Florida Department of Financial Services to waive the state examination for a personal lines agent’s license if the applicant receives an associate’s degree that includes nine credit hours of approved insurance instruction. College interest in insurance specialization programs is “surging” with the passage of the bill, which creates a more meaningful “college–to–career” pathway for degree–seeking students who pursue insurance careers, says the Florida Association of Insurance Agents. “This is a great industry in which to build a career because it provides so much opportunity for people. Our goal is to build the best agency with the best service that’s available to people in Brevard County,” said Sapourn.